MY COLLECTION OF "FORD TRACTOR" TOOLS. 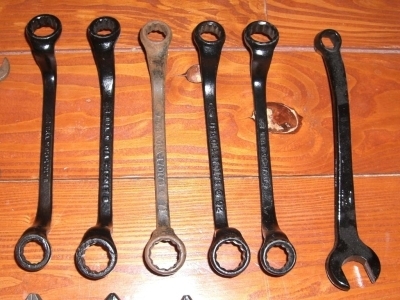 These are not all Ford Tractor Hand Tools, some are car tools, one Plow Wrench is a Ferguson tool, two Adjustable Wrenches may be counterfeit, and one Adjustable Wrench is a look-alike by the same manufacturer as the Ford wrench, but was not made for any of the Ford car or tractor tool kits. This information on logos is provided so you will know what to look for. This is an example of the "Ford script". This is the "FoMoCo" football logo. Look carefully, this is not the same as the modern Blue and grey Ford football logo. Often people will only glance at it, and SEE Ford, because that is what they expect to see. This is the "Ford USA" script as it shows on the Adjustable Wrench. 1a) Part No. 9N-17014 - 11/16 x 1-1/16 Open End Plow Wrench with Ford script. 1b) Part No. 9N-17014 - 11/16 x 1-1/16 Open End Plow Wrench with FoMoCo logo (after mid-1950). Visible markings on this wrench are usually the Ford script or FoMoCo logo, the part number, inch marks, and on the back will be the manufacturer's mark "M" with a casting number. 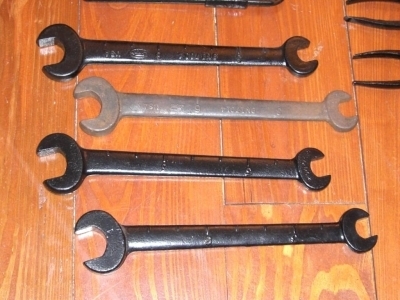 The top one pictured here is a blank wrench without any Ford markings, is identical to the Ford Plow Wrenches. I have no idea what this wrench would be correct for. The second wrench pictured here is a 1948 or later Ferguson wrench. It was made for one of the Ferguson tractors that were produced after Ford and Ferguson parted company. The third wrench is a badly worn example of the correct Ford Script wrench for all kits prior to mid-1950. The last one is a good quality FoMoCo Logo Wrench for tool kits after mid-1950. Other than normal wear, look for damage on the ends of this wrench where it was used as a hammer. Much damage to these wrenches and monkey wrench might have been avoided if Ford had included a hammer in the tool kits. 2a) Part No. B-17015 - 7/16”X 1/2” Open-end wrench (early 9N). 2b) Part No. 01A-17015 - 7/16”X 1/2” Open-end wrench (after April 1940). 3a) Part No. B-17016 - 9/16”x 5/8” Open-end wrench (early 9N). 3b) Part No. 01A-17016 - 9/16”x 5/8” Open-end wrench (after April 1940). Visible markings should include the Ford Script and manufacturer's mark "M" or "MH", but no part number. Early 9N tractor tool kits before April 1940 had the same open end wrenches as the car kits (B-17015/B-17016). The car wrenches are slightly larger, and approx. 1/32" thicker in cross section. The smaller tractor wrenches also appear to have a less rounded profile on the beam. 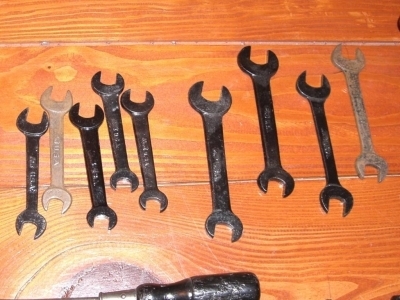 The photo is an assortment of both types of open-end wrenches. 4a) Part No. 81-A-17017 - 6 point, 11/16 box end and 13/16 open end, Spark Plug/Head Bolt Wrench with Ford script (far right in the photo). 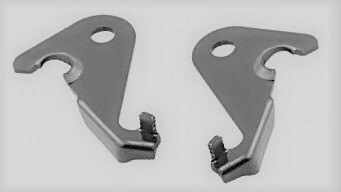 The 6 point version was used in 9N tool kits until August 1939. 4b) Part No. O1A-17017 - 12 point, 11/16 box end and 13/16 open end, Spark Plug/Head Bolt Wrench with Ford script (not pictured). The 12 point version of this wrench was used in the 9N tool kits until April 1940. 4c) Part No. O1A-17017-B - 11/16 and 13/16 Spark Plug/Head Bolt double 12 point box end Wrench with Ford Script. Changed to FoMoCo logo after mid-1950. 4d) Part No. O1A-17017-B - 11/16 and 13/16 Spark Plug/Head Bolt double 12 point box end Wrench with oval FoMoCo logo after mid-1950. Visible markings on this wrench are the Ford Script or FoMoCo logo, the part number, and the manufacturer's mark "M" with a casting number. Part No. B-17020 - Screwdriver. Most experts state that all Ford Tractor tool kit screwdrivers were approx 8-5/8" in length with the shaft extending all the way through the handle. Visible markings on some screwdrivers were a "B" stamped on the side of the blade, but many Screwdrivers had no markings at all. Most had a black painted handle and unfinished shaft but on some the shaft was also blackened. The ferrule may have been polished, plated, or just plain steel. My collection includes some early (9N, 2N) versions that are 8 5/8" long, with a 1 1/8" Dia. Handle, 9/32" shaft, and riveted ferrule. I also have some later versions that appear to have been closer to 8 1/2" long, with a shorter/thinner 1 1/16 Dia. handle, a 1/4" shaft and a crimped ferrule. A drawing at the Benson Ford Library at the Henry Ford Museum dated 8/14/1945 shows that the rivet was made an option with the crimped ferrule. According to that drawing either method could be used by the supplier as long as it could withstand 100 inch pounds of torque. So, after 1945 either type ferrule is correct for a tractor tool kit. We have Mr. Marvin Baumann to thank for this bit of research. His website is www.marvinbaumann.com and you will find a link to it on my LINKS page. It has been reported that there were a few screwdrivers with the Ford script on the shank or ferrule. If you have one of those it should be considered very rare. If you have what appears to be a Ford screwdriver but it is a bit short, look carefully at the tip. It is hard to find a screwdriver tip that has not been ground. Other damage to look for is rot or cracks in the wood handle, hammer marks, bent shaft, etc. The screwdriver is one of the most abused tools in anyone's tool box. Most of us have used them as a pry bar or cold chisel, right? 6a) Part No. B-17021 - Adjustable Wrench (before April 1940 and not pictured here). 6b) Part No. 01A-17021-A - Adjustable Wrench (after April 1940). 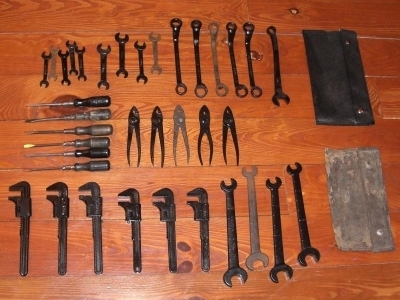 The three smaller (8-1/4") wrenches in the right side of this photo are genuine Ford Tractor wrenches and would be correct for all tractor tool kits after April 1940. For the early 9N tool kits, the larger "square tang" car wrench (B-17021) is correct. I do not have any of those in my collection. 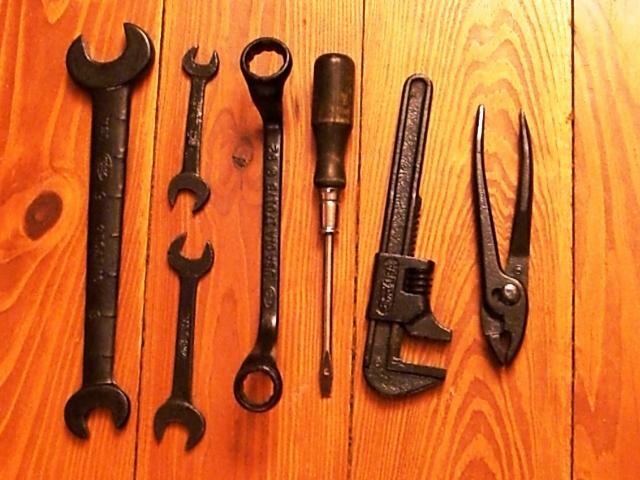 The wrench on the far left is a similar vintage wrench made by the same tool manufacturer. Visible markings on the adjustable wrench are the "Ford USA" script, and the manufacturer's mark "M" usually in a circle, nothing else. Part No. B-17025-A - Bullet-shaped pliers with flat blade screwdriver tip on one handle. Visible markings on the Tractor tool kit pliers should be limited to the manacturer's mark "M" usually in a circle, there is no part number, no Ford Script or Logo. 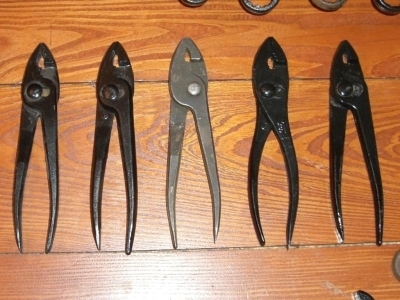 These are all Ford Tractor tool kit pliers except the second pair from the right. That is a pair of automobile pliers, they are not bullet shaped, and have the Ford script. Part No. B-17005-A - . 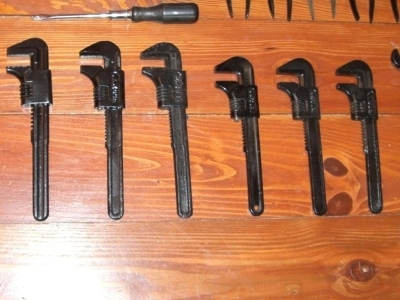 You will often see the tool sets displayed or sold with a black Toolbag. It seems logical that the tools provided would have been in something to keep them from just clanking around in the toolbox. Some experts believe the tool bag was only provided for the automobile tool kits, but I have seen some Ford Tractor parts manuals that refer to part number B-17005-A - Tool Bag. The first photo shows both an original and a reproduction Toolbag. Some experts claim the material used for the tractor tool bag was different from the auto/truck bags. The pliers and all the wrenches were originally finished with a Semi-Gloss Black Enamel Paint. For tools I decide to completely clean and re-finish, I have been using a semi-gloss black powder-coat finish. This "baked-on" finish is much more durable than any painted finish. 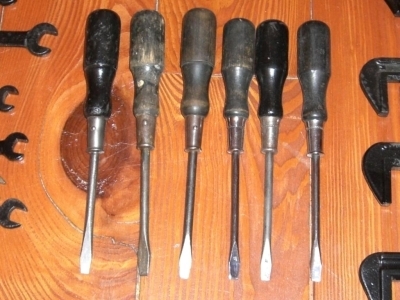 The screwdriver was most often provided with a black handle, plain steel shaft, and plain steel ferrule. There were a number of variations in handle color (maybe even red? ), and some with a blackened shaft. Other cool vintage accessory items and tools you should be on the lookout for include; 17052-Tire Pump Guage and Hose Assembly, 17040-Hand Crank, 17078-Tractor Jack, 17049-Storm Cover, 17045-17046-Tappet Wrenches, and 17125-Grease Gun. Determining exactly which of the tools and accessory items were actually furnished with your tractor is difficult. One of the better clues will be a copy of the parts manual published the same year as your tractor. Look through the entire parts list. Some tools and accessories are listed individually, others are listed only in the contents of various kits. If you have adjustable lifters, get a set of the stamped steel Tappet Wrenches. The only other tool item I have right now is a hand crank. My crank is a recently manufactured item. It works, but is not a very good reproduction of the original. In fact, the one I bought would not even fit through the hole in the front axle, until I ground the paint off. For more information and history regarding these FORD TRACTOR TOOLS click HERE. That is about all I have. If you want or need more information, I suggest focusing your research on the Ford car tools of the same era. The automobile tools have been researched much more thoroughly. Look for sites that back up their information with actual factory drawings. You will often find tractor tool information on those sites, mainly to identify tools they don't want. Having the correct tools is very important for originality points at car shows. Much more so than at most tractor shows.